This is my first skin mod for windowblinds. 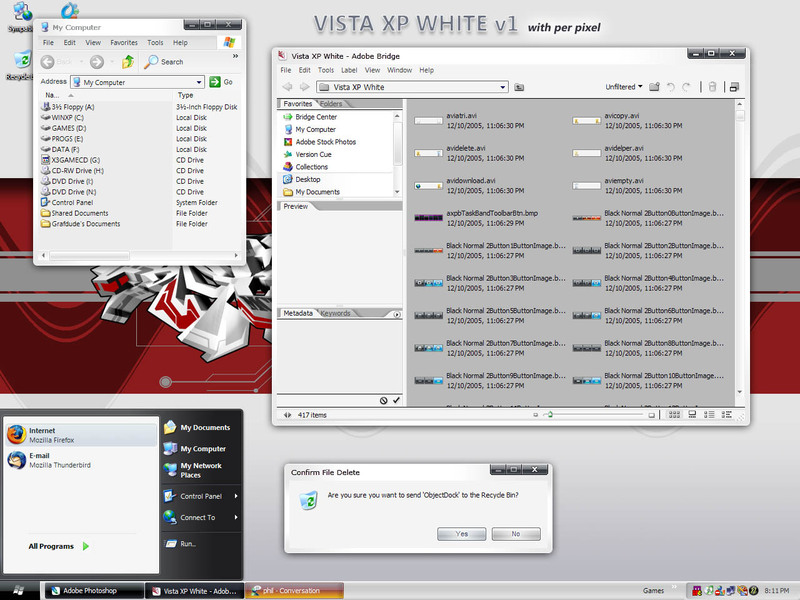 Vista XP was originally made by Kol and by no exception, it is a really sleek theme. It includes a compact version, which makes the start menu smaller. I recommend using this one for now until I realease a new version, since the logoff buttons are invisible on the normal theme, but functional. This skin works for both v4.x and 5, with per pixel and includes the Segui font. I'd like to give out credits to Kol for his superb Vista theme and the people over at #stardock, which helped me during the process of this skin mod. Very nice, anyone know what happened to KOL's normal version with the beta Vistas in it? I can't find it anymore. Grafdude, thank you for your answer. Kol's had to be pulled. You made this from Kol's skin. My advice is to download it as soon as possible before they pull it out. This is one of the best windows blinds ive seen. the overall effect makes me love this and the other black one. not obnoxious, the icons actually tell me something about what they do. contrast works perfect, the mouseover effect on the icons worked great. Thank you for making this. Im using it right now. 5 stars. It couldnt be better. I still prefer KoL_'s VistaXP 3.0, but nice work. And shame on Microsoft for asking the best WindowBlinds skin to be pulled; after all, imitation is the sincerest form of flattery. why not try KoL_'s site for it if you really need it, if not there perhaps deviantart has it? why not try KoL_'s site for it, if you really need it, or why not try deviantart?